15:30 Good afternoon and welcome to AUTOSPORT Race Centre Live. Over the next few hours, we will be bring you as it happens commentary from the spectacle that is the Indianapolis 500. 15:31 The 98th running of America’s blue riband event gets underway in approximately 40 minutes, which gives us plenty of time to remind you of some of the main developments in the run up to this year’s race. 15:32 Ed Carpenter will lead the 33-car field to the green flag at approximately 17:12 UK time (BST), having topped what was a record-breaking qualifying session. 15:33 The gap between Carpenter’s pole time and that of last-place qualifier Buddy Lazier was just 2.1509s - the closest in the history of the event. 15:34 James Hinchcliffe came closest to beating Carpenter, which was a remarkable performance considering that the Canadian missed the opening days of practice while recovering from concussion he sustained in the race on the Indianapolis Motor Speedway road course a fortnight ago. 15:38 Indy 500 returnee and 1995 race winner Jacques Villeneuve was solid in qualifying and starts today’s race from 27th. 15:39 Villeneuve's return marks the comeback of a driver who breaks IndyCar’s record for the longest gap between starts. Lazier, who won 12 months after the Canadian, is also back in the field in what is a part-time campaign for the 46-year-old driver. 15:41 Those two aren't the only former Indy 500 winners in this year’s field. Far from it, in fact, as Helio Castroneves, Scott Dixon and Juan Pablo Montoya will also be wanting to kiss the bricks again today. 15:43 Montoya’s return will be an intriguing one to watch as the Colombian has been building towards this weekend. His optimism has been backed up by his early pace on the speedway and he has routinely been among the fastest at the end of each day. 15:44 A former NASCAR foe will be joining Montoya today in the form of the infamous/notorious Kurt Busch, who becomes the fourth driver to contest both Indy and NASCAR’s 600-miler in Charlotte, which is generating a lot of interest across both motorsport disciplines. 15:46 Busch seems to have had little trouble adapting to the car - bar a shunt earlier in the week - as preparing for an oval seems relatively straightforward, but even so, he was impressively quick during the first three practice days and qualified a respectable 12th. 15:50 Pre-race driver introductions completed and it's safe to say the sea of fans are immensely eager ahead of today's race. Incredible atmosphere! 15:57 It's nearly national anthem time, and that means racing isn't far away. It's not going to start immediately but tuning in now means you'll be ready and waiting. 16:17 Indianapolis 500: Jim Nabors' rendition of Back Home Again in Indiana is a central part of the traditional build-up to the 500, but this year's rendition was especially poignant - the 83-year-old is performing it for the final time. 16:17 Indianapolis 500: Mary Hulman-George gives the command to start engines. 16:18 Indianapolis 500: It is an absolutely perfect day in Indianapolis - the sun is out and so are the crowds, with an estimated 250,000 packed into IMS for this 98th running of the race. 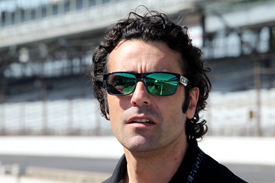 16:21 Indianapolis 500: Dario Franchitti has led a lot of laps around this place. Not sure if these ones count - he is driving the pace car as the field heads out on its parade laps - but it's still nice to see him here. 16:25 Indianapolis 500: Green flag! 16:26 Indianapolis 500: Hinchcliffe got the jump on Carpenter at the start and takes an early lead. 16:28 Indianapolis 500: Not a great start from one of 2013's heroes Carlos Munoz, who has fallen from seventh to 11th. Even worse start from Ryan Briscoe who brushed the wall on lap one, then bounced back down and tapped compatriot James Davison. Davison's car seems OK, but Briscoe has been forced to pit for a new front wing. 16:31 Indianapolis 500: The current top five: Hinchcliffe, Carpenter, Power, Castroneves, Andretti. 16:36 Indianapolis 500: Carpenter has retaken the lead. A little further back, Scott Dixon has made some early progress and is up to seventh. 16:41 Indianapolis 500: There's a lot of overtaking going on behind the leaders: Ryan Hunter-Reay has claimed 10 scalps so far and is P9; Townsend Bell has made up 11 places and is 14th. 16:47 Indianapolis 500: Carpenter and Hinchcliffe have both pitted. Will Power led a lap before making his own stop, and Juan Pablo Montoya currently holds P1. He'll visit the pits any moment. 16:50 Indianapolis 500: The leaders have cycled through their first stops, and Hinchcliffe has emerged back in the lead ahead of Carpenter. 16:53 Indianapolis 500: Another lead change - Will Power made up two places in as many laps, and now in P1. 16:58 Indianapolis 500: The lead five are breaking away ever so slightly, and the fifth driver in that group - Helio Castroneves - has just been warned for blocking Marco Andretti. "Hate the bad luck for @GrahamRahal and his @NationalGuard crew. Keep ya heads up." 17:08 Indianapolis 500: A slight bobble from Power, and Marco Andretti swoops into the lead. The crowd goes mad. 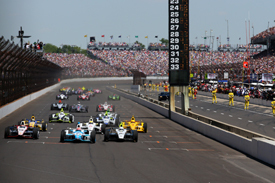 17:10 Indianapolis 500: Andretti and Power kick off the second round of stops. Power has beaten Andretti off pit road. Meanwhile, Buddy Lazier has been black-flagged for a pit safety violation. He's currently running 32nd. 17:14 Indianapolis 500: The new leader is Castroneves, with Andretti heading the pursuit. Power has been shuffled back to fifth. Meanwhile, Tony Kanaan's hopes of a repeat win have been dealt a massive blow, with the Brazilian having been stuck in the pits for more than 43s. 17:18 Indianapolis 500: Kanaan is still in the pits with myriad mechanical problems, and it's a similar scene for Graham Rahal in the RLL pitbox. 17:21 Indianapolis 500: It sounds like Rahal's race is over. "Electrical gremlin i didn't think the car ran right from the start - it was just slow. And now the car just keeps shutting off." "Gutted for @TonyKanaan & the 10 guys, on more positive news @scottdixon9 is moving up nicely..."
17:22 Indianapolis 500: Pippa Mann is also having some sort of problem - she's around 20mph off the pace, and it has caused a few hairy moments for the cars around her. It wouldn't be a surprise to see her flagged into the pits if her speed doesn't improve shortly. 17:23 Indianapolis 500: Just as we write that, Mann is more or less back up to speed. 17:32 Indianapolis 500: Helio Castroneves veers into pitlane to get the third round of stops underway. He's happy with his car, and won't be asking for any changes. On an unrelated note, it's surprising that we're closing in on 100 laps and haven't had a yellow yet. 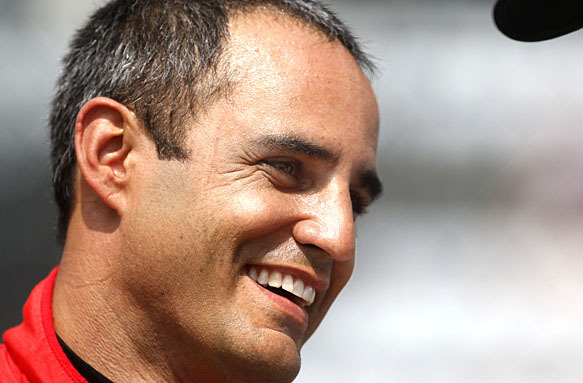 17:37 Indianapolis 500: Kanaan rejoins the race, 18 laps down. Up front, all the frontrunners have stopped and the new leader is Ryan Hunter-Reay. That's impressive considering that he started from about P74 (well, 19th...) on the grid. One guy we've so far neglected to mention is Kurt Busch. As the race hits the half-way mark, he's sitting in 17th and within range of his targeted top-half finish. 17:44 Indianapolis 500: Castroneves reclaims the lead from Hunter-Reay. If the race continues like this, it's worth keeping an eye on Montoya - he has had better fuel mileage than his rivals in every stint to far, and is currently lurking in fifth. "The first half of the race was the fastest 100 laps in #Indy500 history." 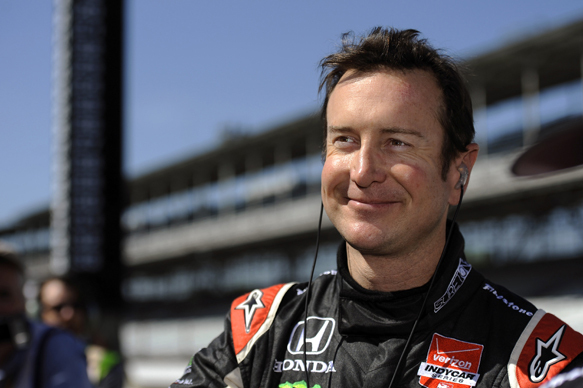 17:47 Indianapolis 500: Of course, if there's anybody who is enjoying this long spell under greens, it's Busch - he has an appointment 600 miles away in Charlotte later today, so every extra spare minute is helpful. Brit Martin Plowman has been black-flagged for a pitlane safety violation. 17:48 Indianapolis 500: Hunter-Reay moves back into the lead, and at the other end of the field, Buddy Lazier retires with a mechanical problem. 17:53 Indianapolis 500: Wait, the leaders are starting to pit again already? This persisting green flag is distorting AUTOSPORT's sense of time. The possibility that we'd get this deep into the race without a caution genuinely hadn't occurred to us. 17:57 Indianapolis 500: It looks like Will Power will have to wait at least another 12 months to get his face onto the Borg Warner - he has just been given a black flag for a pitlane speed violation. "All this green flag running means @KurtBusch could enjoy a slap-up meal before flying to Charlotte. #Indy500." Busch is currently running in 15th place. ... who has just been issued a penalty for pitlane speeding. That's two identical penalties in less than five minutes for the Penske team. 18:02 Indianapolis 500: Montoya is now P16; Power is P19. Safe to say that they're now praying for yellows. "Holy s*** balls , power and jpm speeding!" 18:11 Indianapolis 500: Penske's prayers are answered - Ganassi's Charlie Kimball spins and tags the wall, and we're under yellows for the first time today. 18:15 Indianapolis 500: Prior to the caution things were looking good for Hunter-Reay, who was sitting in second behind Marco Andretti and saving fuel while his team-mate did all the work. All five of the Andretti cars are currently in the top 10. 18:16 Indianapolis 500: The pitlane opens, and almost the entire field takes advantage of it to make a stop. 18:22 Indianapolis 500: Restart. Hunter-Reay mugs Carpenter to claim the lead; Carpenter takes it right back. 18:24 Indianapolis 500: More penalties - we believe for Villeneuve and Tagliani - for taking service in a closed pit. Hunter-Reay has recaptured the lead from Carpenter. 18:28 Indianapolis 500: Carpenter and Hunter-Reay are still squabbling. Everyone still has to make one more stop, although Carpenter made his last visit to the pits right before that caution, and has been out for eight laps longer than the cars around him. 18:30 Indianapolis 500: Scott Dixon took some wing out during his last stop. We don't know whether that had anything to do with him just coming through Turn 4 backwards and hitting the wall. 18:32 Indianapolis 500: The cars around Dixon were lucky not to be caught up in that - as well as the spinning Ganassi car, there was quite a bit of debris. Dixon is fine. 18:33 Indianapolis 500: Newgarden's car has also come to a stop at the pit entry. Not sure what happened to him. The pits are open, and naturally everyone dives in. This brings Carpenter back into sequence with everyone else. 18:34 Indianapolis 500: Ganassi's Mike Hull is ruling out the wing change as a factor in the accident. Meanwhile. we've just seen a replay that solves the Newgarden mystery - he slowed for Dixon's accident, and got hit from behind by Plowman. 18:42 Indianapolis 500: ... and we're straight back under yellows. Carpenter, Hinchcliffe and Bell tried to go three-wide, through Turn 1. It didn't work: Carpenter and Hinchcliffe touch and are spat into the wall. 18:44 Indianapolis 500: There might have been contact between Bell and Carpenter immediately before Carpenter hit Hinchcliffe. There is much arm-waving from both Carpenter and Hinch now. Both of those guys thought they had a shot at winning. 18:45 Indianapolis 500: So that's what Ed Carpenter looks like when he's angry. We'd always wondered. 18:46 Indianapolis 500: Kimball, Carpenter and Hinchcliffe have all been checked at the medical centre and cleared to drive. "RHR has this race in the bag. They are going to get stupid behind him at every re-start #indy500"
18:48 Indianapolis 500: Restart! Three-wide for second place again, but this time they get away with it. 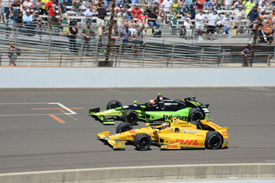 18:50 Indianapolis 500: Lead battle is getting busy between Hunter-Reay, Andretti and Castroneves. The last dozen laps are going to be manic. 18:52 Indianapolis 500: Just 15 laps to go and Hunter-Reay leads ahead of Castroneves and Andretti. 18:54 Indianapolis 500: The lead battle has calmed down somewhat after a few frantic laps. 18:54 Indianapolis 500: Munoz, meanwhile, is about to join the leading trio as he latches on to Andretti's tail. 18:55 Indianapolis 500: Ten laps to go and yellow is waved for debris at Turn 2. 18:56 Indianapolis 500: And just as a caution is called Bell crashes heavily into the wall. 18:58 Indianapolis 500: Race has been stopped with nine laps remaining. A right decision given the amount of debris that needs to be cleared. 18:59 Indianapolis 500: Cars head into the pitlane to the approval of the thousands of spectators, who appreciate the fact they will (hopefully) see a proper race to the finish. "It's a good thing he already had a concussion last week." "Now this is not good for the tires , they will get much cooler than circulating , pressures can drop and change handling." 19:09 Indianapolis 500: Word has it that we'll be back up and running in a couple of minutes. Hinchcliffe, meanwhile, has been giving his side of the incident he had with Carpenter and took his share of responsibility for it. 19:10 Indianapolis 500: Engines are fired up and the drivers head back out. Two laps behind the pace car and just six until the chequered flag. 19:13 Indianapolis 500: And we're back to racing! Hunter-Reay just about manages to fend off Castroneves who has Andretti for close comfort. 19:14 Indianapolis 500: Hunter-Reay pulls away into Turn 1, but Castroneves is keeping him honest. 19:15 Indianapolis 500: ...but with three laps to Castroneves makes a dive down the inside into Turn 3! Hunter-Reay is let off and keeps pushing. 19:16 Indianapolis 500: And Castroneves passes Hunter-Reay with just two laps to go! 19:17 Indianapolis 500: ...and Hunter-Reay leads with just one corner to go! Fantastic final half-dozen laps! 19:18 Indianapolis 500: What a finish! Hunter-Reay claims victory by just 0.0600 seconds ahead of Castroneves! 19:20 Indianapolis 500: Hunter-Reay punches the air in celebration as he soaks up the applause from the 230,000 spectators while on his way back to the pits. 19:22 Indianapolis 500: While we wait for Hunter-Reay to celebrate in Victory Lane, Townsend Bell has been checked, cleared and released from the infield medical centre. "Awesome run @KurtBusch and one heck of an effort @h3lio." 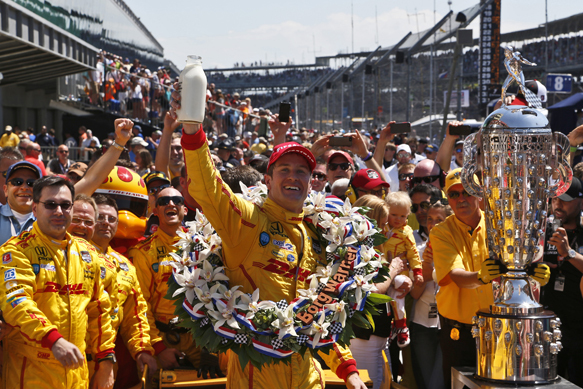 19:22 Indianapolis 500: Hunter-Reay has a swig of milk and tells everybody that "it is a dream come true." "I didn't know if we had it. I don't even know what to think..." he says. "I knew we had a good race car. I'm so excited right now, I don't know what to think!" 19:26 Indianapolis 500: Runner-up Castroneves took his time to get out of the car, but denies he was crying. "Hunter-Reay did an outstanding job. We were racing clean, fighting for inches. It was a hell of a job. "It's good when second feels this bad." 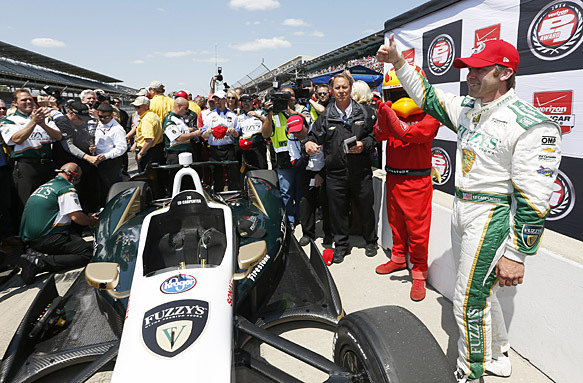 "Congrats to a truly great guy, a great champion, and a fantastic winner of the #Indy500. One of my best buddies @RyanHunterReay!" 19:27 Indianapolis 500: Hunter-Reay is the first American driver to win the Indy 500 since 2006, when Sam Hornish Jr won it for Penske. 19:29 Indianapolis 500: Montoya ended up fifth, but was fighting for victory before losing ground with that pit speeding penalty, which happened when he knocked the limiter off while removing a visor tear-off. He doesn't reckon today was his day, though. "Maybe I would've finished a place better if I hadn't made the mistake, but that's all we had. We weren't quick enough in traffic." "Wooooow that race was awesome!!!! #indy500 incredible racing, would love to be apart of it one day #trueracing." 19:43 The benchmark for the Indy/Charlotte double is Tony Stewart's 2001 performance. ...then came third at Charlotte despite a spin. Busch has to start at the back for the Cup race as he will miss the drivers' briefing. 19:45 Keep an eye on the AUTOSPORT.com news section for full reports from both Indianapolis and Charlotte later, along with plenty of reaction and follow-up through the week both online and in print. AUTOSPORT Race Centre Live returns next weekend for an epic two days of action headlined by MotoGP at Mugello, an IndyCar double-header on the Detroit streets, and the Le Mans test day.